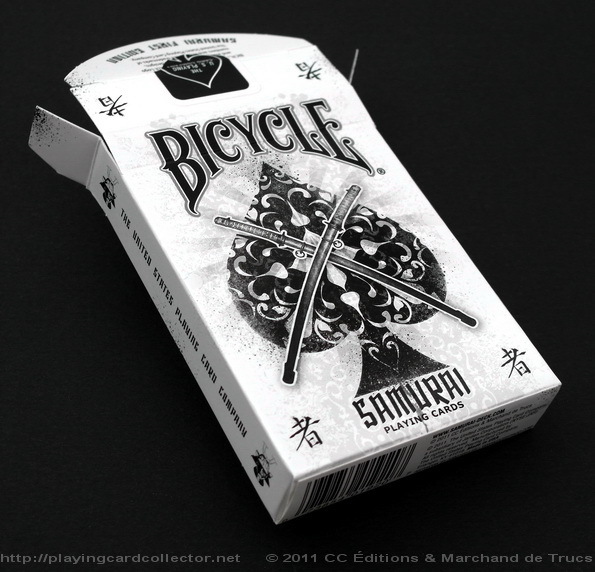 Bicycle Samurai Playing Cards [First Edition] are the heroes of this blog today. I was able to find them on JP Playing Cards site (find a 10% discount below). 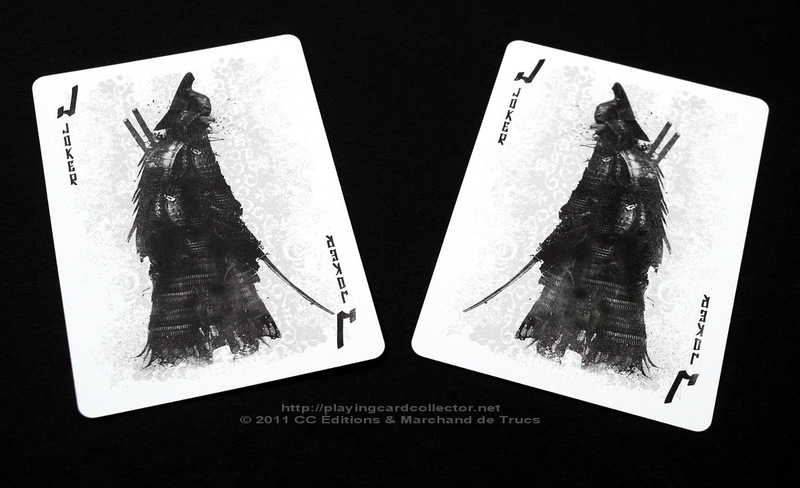 This deck is dedicated to defenders of persons in the upper ranks of Japan society – the Samurai (the middle and upper echelons of the warrior class). 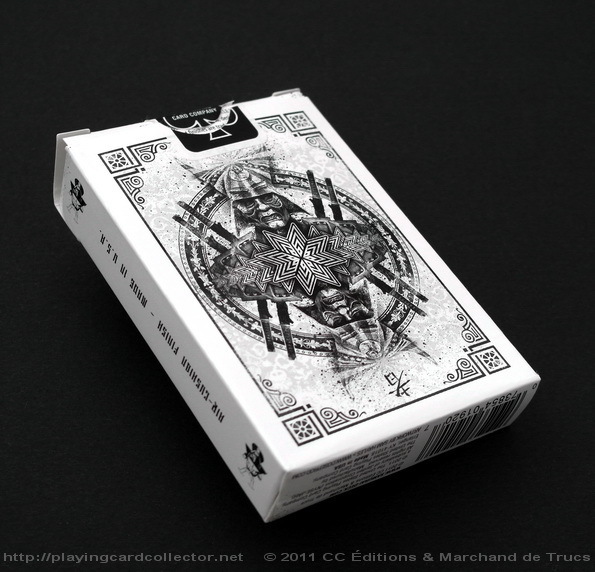 Playing cards were produced by the French company CC Éditions & Marchand de Trucs and printed by USPCC in 2011. The deck was available on a special site. Now it is sold out and can be found only on the secondary market. 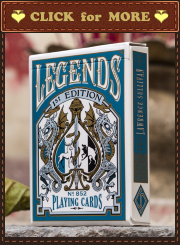 Playing cards were designed by the English artist Sam Hayles (DOSE Productions). Readers of this blog should know him as this is the fourth his design featured on pages of the blog. This deck was designed for magic practice. So it has a minimum of customization (a custom tuck case, the Ace of Spades, Jokers and backs). The deck: 52 playing cards + 3 Jokers (two of them are identical) + 1 blank card. Poker size. All court cards and number cards are Bicycle standard cards. Playing cards were printed on Bicycle Stock and have Air-Cushion Finish. The Ace of Spades is featured on the front part of the tuck case. There are also two identical Japanese characters in the bottom left and right corners. 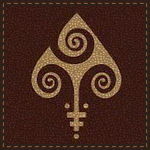 These characters are also on the left and right parts of the upper side of the tuck case; on the upper and bottom middle parts of the back of the tuck case which repeats the back design of playing cards; on the Ace of Spades. The character has the following meanings in Japanese: he who; those who; the person. As a rule it is the second part in different words naming people with different occupations. It is a strange choice. Samurai traditional helmets and face shields (mengu) are depicted on the sides of the tuck case with the following signatures between them: “United States Playing Card Company” (the left side); “Air-Cushion Finish – Made in U.S.” (the right side). 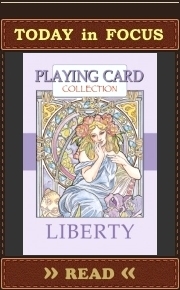 This is the first edition of this deck in accordance with the statement made on the flap of the tuck case. There is no information about any plans regarding the second edition of it. The term samurai originally meant “those who serve in close attendance to nobility” and was written with a Chinese character that had the same meaning. These people were the military nobility of medieval and early-modern Japan. An early reference to the word “samurai” appears in the Kokin Wakashū (Collection of Japanese Poems of Ancient and Modern Times, 905–914). Samurai was a word used by the aristocratic class with warriors themselves preferring the word bushi. The terms bushi and samurai became synonymous near the end of the 12th century. Samurai warriors described themselves as followers of “The Way of the Warrior” or Bushido. From the earliest times, the Samurai felt that the path of the warrior was one of honour, emphasizing duty to one’s master and loyalty unto death. Each samurai had deep respect for wisdom of his military leader or the emperor and looked forward to a glorious death in the service of them. As you can see each Joker features a samurai dressed in his armour with an unsheathed sword. The background of Jokers has a beautiful intricate pattern made with light grey colour. This pattern is repeated on the Ace of Spades and the backs of playing cards and the tuck case. Samurai in armour, 1860s. Hand-coloured photograph by Felice Beato. The first types of Japanese armours identified as samurai armour were known as yoroi. These early samurai armours were made from small individual scales known as kozane. The kozane were made from either iron or leather and were bound together into small strips, the strips were coated with lacquer to protect the kozane from water. A series of strips of kozane were then laced together with silk or leather lace and formed into complete chest armour. The Samurai wore a long sword katana (or tachi) together with a smaller sword such as a wakizashi or tantō. This combination of swords became the symbol of the samurai and is referred to as a daishō (literally “big and small”). This combination of two swords is shown on backs of the playing cards (see below). Crossed katanas in their scabbards against the big Spade pip with design elements are depicted on the Ace of Spades. The background of this ace has also beautiful intricate pattern made with light grey colour. It is possible to recognize rays of the sun among design elements of the pattern. They are also made with light grey colour. Japan is often called “the land of the rising sun” **, so this was a nice idea to incorporate rays of the sun into the design of these playing cards. As it was pointed before, Bicycle Samurai court cards are Bicycle standard court cards. It can be only added that red and blue colours in this deck look as they are slightly darker than in some Bicycle standard deck. But this difference is so insignificant that can be counted illusive. 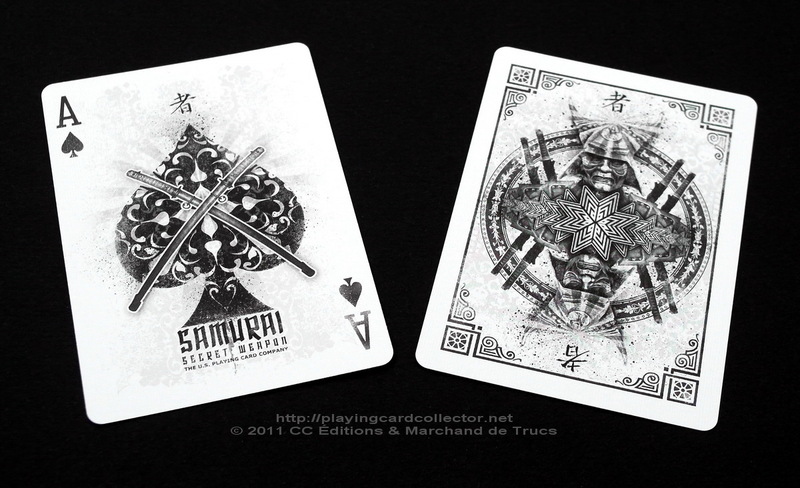 A samurai in his armour and with his swords is depicted on the backs of these playing cards. You actually can see only the top part of the armour: the helmet (kabuto), a neck guard (shikoro), large rectangular shoulder protection (sode) and samurai famous facial armour (mengu). Like on the Ace of Spades the background of backs has also beautiful intricate pattern made with light grey colour. The sun shines on the top of the samurai helmet. There is an octagram in the very centre of the back design. It is probably used to add beauty to this design as an octagram doesn’t have any special meaning for the culture of Japan. There is a circle behind the samurai on the backs of the playing cards. Ensō (a Japanese word meaning “circle”) is one of the most common subjects of Japanese calligraphy even though it is a symbol and not a character. It can symbolize absolute enlightenment, strength, elegance, the universe and the void; a moment when the mind is free to simply let the body/spirit create (in Zen Buddhist painting). Zen Buddhists believe that the character of the artist is fully exposed in how she or he draws an ensō. Only a person who is mentally and spiritually complete can draw a true ensō. ** Japan is called the land of the rising sun due to the fact that it is located at the eastern most part of Asia and is the closest to the world date line. So the characters that make up Japan’s name mean “sun-origin”.